Hey there fashionistas! Today I will talk about one very special and stylish piece that you need to have in your collection. Ladies will fall for this one! It is the backless top. It looks so feminine. If you want to show off a little skin, rock these seasons’s favorites. There are so many styles to choose from. For the bravest, there are blouses that uncover the whole back! These ones look so trendy and can be worn with evening outfits. Perfect for a night out. Despite these, there are many others to choose from. Lace details will add romantic note to your look. A net with stripes will look so fabulous. It’s up to you to choose your favorite one. This shirt looks surprisingly amazing! No additional details are needed. The back looks so wonderful. The bow adds up on the chique look. I definitely fell in love with this piece!Fun geometrical shapes will make your combination look even more interesting. And this red jumpsuit looks so hot! It is a classy piece that you will love to have in your wardrobe. There are a few important things that are worth mentioning when we talk about backless clothes. At first, you need to pair it with the right bra. Backless is ment to be worn backless. Bra stripes won’t fit here unfortunately. They will be an excess. So always choose wisely. Silicone bras will be a good choice. In addition, backless can not be worn anywhere, as it might show too much skin. Always be careful when combining it. It will be perfect for night outs and casual outfits, but not for professional and office outfits. These shirts are a huge hit now! 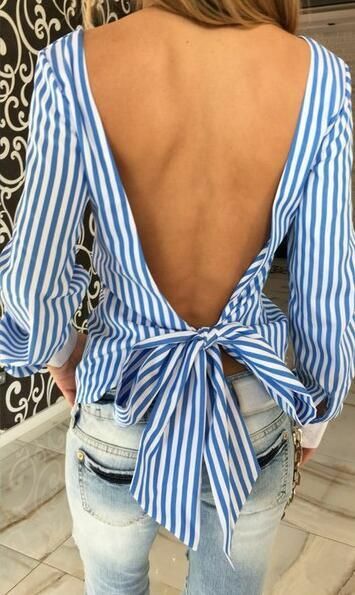 Blue striped shirt looks so ordinary in the front. But the back is simply amazing. The bow is such a nice detail.